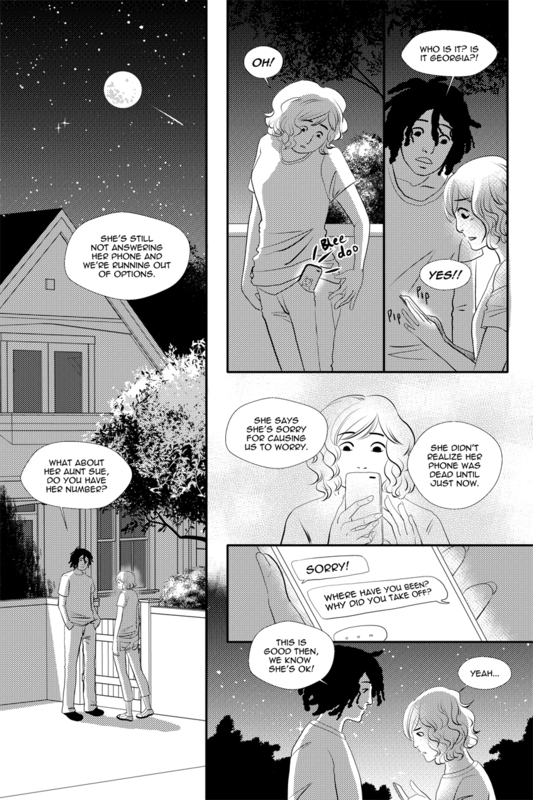 Back from vacation with new pages! I had a pretty good time. I got to see lots of reef fish I hadn’t seen before while snorkeling and I also encountered a some sea urchins, which I stayed the heck away from. The bad parts were a crazy lady yelling at me in a bathroom and my mom cut her foot. It wasn’t severe but she was pretty crabby about it for a while. : x Anyhoot from here on out normal updates will resume! Will Georgia admit to being with Jun or will she just say that she’s away? As to why she’s away? Hmm… needed to get away and have a brief change of pace to clear her mind. Got to be careful with Rita to keep her from exploding (figuratively, of course). Now, will Georgia be careful, or will she just blurt out that she’s away with Jun? welcome back! ….what was the lady yelling at you about in the bathroom? Weird. Haha…oh man….it was really inappropriate….probably not safe to say here as it was pretty racist. But needless to say when someone is yelling at you and banging a trash can against the restroom stall while you are on the toilet, it is unsettling and absolutely nuts. She was nuts. Good thing Rita keeps her phone charged lol.